You are highly trained, elite specialist of the Navy being briefed on your upcoming mission. 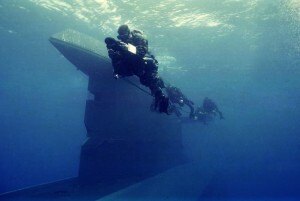 As a member of the Navy SEAL’s this is something you have done many times before. Unfortunately, before this particular mission even begins, things go terribly wrong. As you begin to realize the scope of your situation, you recognize that your training alone will not be enough to keep you alive. You will have to rely on your senses to survive and save the mission. A keen sense of observation and the ability to solve puzzles will be your biggest assets. You know you can do this! Step up and meet the challenge head on! Do you have what it takes to escape Navy SEAL “Mission Impossible”? Click Book Now to accept this mission. This escape room holds up to 8 team members. Have a bigger party? Our Death Row escape room, also in Panama City Beach holds up to 10.